So, I’ve been slowly grinding away at some Fire Warriors with what little painting time I seem to have nowadays. Most of this time has been cycling through different arrangements of turquoise, trying to get something worked up that I’m happy with. Somewhere along the way, I remembered that I painted up this Demigryph using a turquoise that I was exceedingly pleased with, so I checked my notes, and included it as one of the test schemes. I’m pretty happy with the result (especially after settling on a better approach to the Fire Caste symbol). 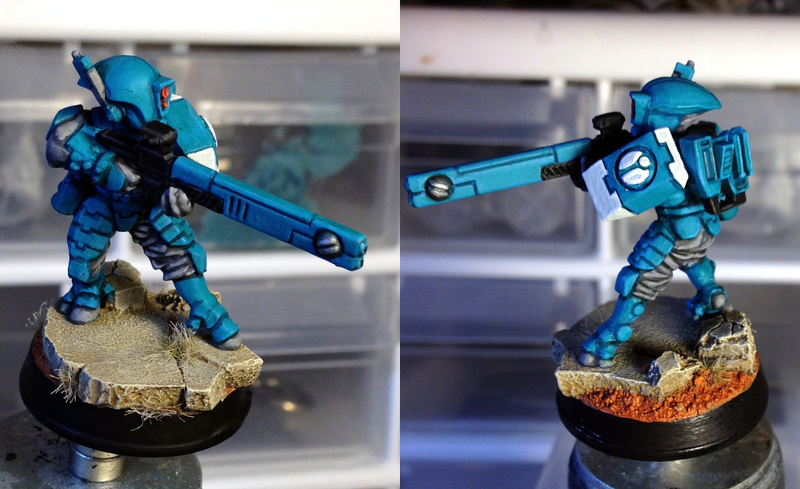 So, I basically redid all of the other in-progress Fire Warriors: another basecoat, more turquoise, etc. This process has felt interminable: not enough time to paint, going back over stuff I’d already painted, too many minis (7) in the batch, etc, etc. But I was blessed with some time Friday so I knuckled down and powered through the bastards: washing them before turning in Friday night. Then, Saturday morning, I realized I used the wrong wash. I pulled my mix from some notes I’d kept… but not the right notes. It’s noticeably more blue and not-at-all green here. I assure you, the difference is even more significant to the naked eye. So, that’s the last, what, month? down the drain. I could repaint these guys, but given that most of them already have two full coats of paint on them, a third isn’t going to do them any favors… nevermind the psychological difficulty involved in painting them again. So, I’m shoving these guys to the back of the table. I’ll probably finish them at some point (they’re, like, 75% there) and maybe use them as test models for weathering or something. Blargh. 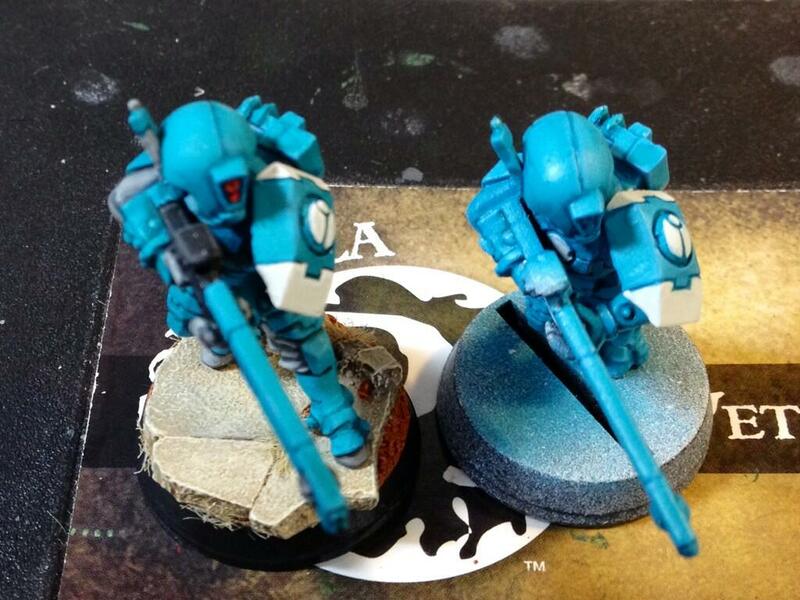 This entry was posted in Warpstone Pile and tagged hobby, tau empire on 2013-07-01 by Rushputin.